Eddie finally learns that Trent's sister, Tina, is the one that wrote that note. As Eddie and Tina go out, Trent tells Eddie to end it; but when he does he ends it right where Tina tries to help him improve to be a better person. Eddie breaks up with Tina and gets a lot of heat from not only Trent but Louis as well. Eddie understands and tries to win back Tina but after trying his hot pancake, she's not ready for a relationship right now and tells him when he's ready for one, to ask again. Meanwhile, Cattleman was awarded the Golden Prun Award but there's a so-called cruise that could close down the restaurant with all the seniors' citizens. But thanks to Eddie's help, they got the seniors to leave with the front of the menu being so small. Also, after Evan failed the fitness run test, he asked Jessica to help him train. But Jessica isn't what you would call fit to run and tries everything in the book to not go. That is until Evan sees that she's not going because of him losing his fencing match. But she proves to him and goes along. In the end, they finish last but at least they finish what they started. "Trentina" was a very good episode. The Eddie and Tina storyline was so good and Isabel Oliver Marcus steals the episode as Tina. Strong character development and writing as well but the performances were amazing from the cast. Overall, I give this episode an 8.5/10. Louis and Evan suspect that Emery has a secret. Could Eddie call Jessica's bluff when she believes that he can't do anything on his own? Here's a recap! When Louis sees that Emery is wearing cowboy boots around the house, Even gets Louis to think that maybe he's not going to his practices. After checking with the coach, Louis learns that Emery has quit the team weeks ago. 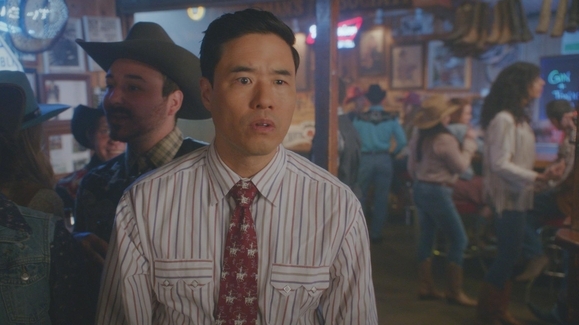 Louis and Even do a stakeout and sees that Emery has ditched volleyball for a cowboy bar, which Louis learns that Emery is just trying out things to figure out what he enjoys. So the two line-dancing their talk and come to understanding. Jessica has been tired of Eddie's slacking; even when he works on his vitreal video game he based on his family. Eddie gets so fed up with his mother's rules that when she refuses to let him go on a cultural exchange program in Taiwan. Eddie had it and decides to leave home and live in Horace's apartment; which isn't quite what Eddie expected it. But when Jessica confronts Eddie; she's totally surprised by how he takes good care of himself and after he comes back home she decides that Eddie is responsible enough to go to Taiwan. "These Boots Are Made for Walkin" was just another amazing episode. I loved the storylines between Louis and Emery and Jessica and Eddie as they're learning from one another. The performances from the cast were amazing and Constance Wu and Forrest Wheeler really gave their best performances. Overall, I give this episode a 9/10.